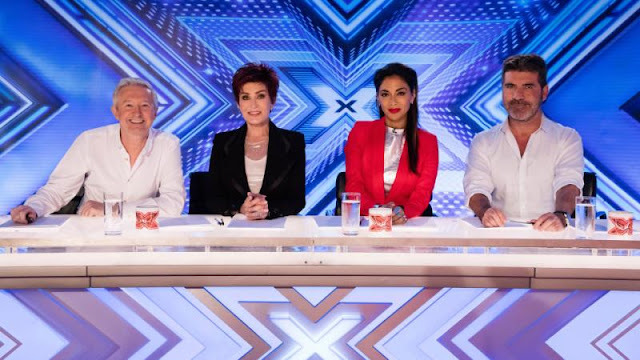 The Custard TV: Oh The X Factor is back: Bring on the cliches! Oh The X Factor is back: Bring on the cliches! Any series in its fourteenth year would be showing signs of age, but my issue with The X Factor is whenever it claims to 'reinvent' itself it just becomes more of the same show. Last year was an utter mess that Simon will probably spend this series urging viewers to forget, and I'll admit having Dermot O'Leary back was nice and comforting, but Dermot aside I found this over-long opener to be painful. From the opening sequence that showed young viewers being 'inspired' by former X Factor contestants and going to audition themselves. Curiously no one seemed to be inspired by Steve Brookstein or Sam Bailey. It's always been a show full of its own self importance which has always wound me up so that wasn't the best way to win this jaded viewer back. The room auditions are back which means we won't meet the fickle arena crowd until the God awful 'six chair challenge' but that's after Boot Camp. It started OK with a boyband 'Yes Lad' who were nowhere near as good as they thought though with the judges heaping praise on them it's no wonder people get deluded about their own potential on these sort of shows. The 'banter between the judges all felt a little forced and predictable but did help the show move along. Then it happened. We entered cliche-ville. From the elderly Grandad who inspired his quite frankly tarty sixteen year old Granddaughter to pursue her 'gift' for singing. Of course we got the obligatory shots of Granddad beaming with pride as he watched his protege belt out a ballad on the bigscreen. Then of course there was the young Ed Sheeran wannabe complete with his guitar who came in singing 'country roads' but got the dreaded Cowell hand. For readers unfamiliar with how the Cowell hand works, Cowell will stop the singer mid-song with his hand and then ask if they another song prepared. The act stumbles seemingly dumbstruck and then reveals they do have their own 'personal' song they could perform off the cuff. What a coincidence this is! In this case the song happened to be about the man's brother who had passed away. I know this sounds incredibly harsh, but these shows make you cynical. As Sharon's porcelain face managed to squeeze out a tiny bit of liquid and Scherzinger pouted her lips I felt emotionless. This wasn't an emotional experience but merely another X Factor audition box ticked. All we needed to complete our set was someone to say they'd been bullied...... BINGO! A young girl very close to her parents 'wowed' the judges with her rendition of another bland ballad but not before telling them she'd been bullied which the crafty editors had hoped would have us reaching for the nearest tissue. I did. I went to the toilet at the point. The problem is, by the time we've had the obligatory sad or sob story I find myself immediately disinterested about whether he or she actually has a decent pair of lungs on them. Here's my ideal X Factor contestant "Hi, my name John, I'm 22 I work a normal job, did OK in school. Had a lot of fun at uni, all of my family are fit and healthy, I don't actually have any pets, I've had a lovely life. I've come along today because I think I've got a good voice and I'd like to audition for you." I'd be on John's side straight away. John wouldn't make great television, and for all I know John has auditioned before but been bumped in favour of someone who's dog has been hit by the car on the morning of the audition. In a complete moment of irony when the judges were forced to vote whilst a contestant's piano ballad continued to play in the audition room Cowell uttered the words 'can we turn this off, I feel like I'm the sad story on X Factor' The problem is after so many years we're too familiar with how it works. They could change the judging panel every week but the show can't surprise or touch an audience who know exactly what they're going to get. The weather last night was disastrous so that can't be blamed on the show's lowest-ever launch night in the overnight ratings. Even worse than last year's mess. Of course, everyone at the aforementioned TV Festival was asking folks to pay little attention to overnight figures, but that's only if they're bad like this I'm sure. There was one and only highlight last night. The X Factor Continues until CHRISTMAS.